Note: This is part 2 in the #HappinessHappensMonth celebration series. The following is an excerpt from The Happiness Toolbox by PESI expert and author Jonah Paquette, PsyD. Click here to read Part 1. We spend much of our lives on autopilot, aimlessly shifting from task to task, with little conscious awareness of where we are or what we’re doing. We drive to and from work with little memory of the actual experience. We eat a meal and it’s gone before we realize it. These experiences are quite common, and are the hallmark of mindlessness. In fact, one notable study found that we spend nearly half our waking hours in this sort of state. Worse yet, we tend to be most unhappy during these periods when our mind is wandering. ● Maintaining moment-to-moment awareness of our thoughts, feelings, sensations, and surrounding environment. ● Practicing acceptance of these experiences without judgment, meaning we observe what’s happening around and within us without wishing for them to change. The past decade has seen a surge of research on the many benefits of mindfulness. As it turns out, the practice of mindfulness has been linked to a host of positive outcomes, including improved psychological health, enhanced physical well-being, and even improved interpersonal relationships and job performance. Studies show that individuals who regularly practice mindfulness perform better across a number of areas when it comes to mental and emotional health. For example, people who practice mindfulness have been found to have lower rates of depression, stress, and anxiety, while having higher rates of happiness, well-being, and positive emotional states, according to research. Additionally, mindfulness has been linked to improved memory, concentration, and focus, along with enhanced problem-solving skills and creativity. Not only are mindful individuals happier, research suggests that they are healthier as well. Studies have found that individuals who regularly practice mindfulness have better overall physical health, require fewer hospital visits, and spend fewer days in the hospital than their less mindful peers. Additionally, they have stronger immune systems, and are better equipped to combat chronic illnesses. Some studies have even found that mindfulness practice has been linked to lower levels of physical pain, even among patients with chronic pain. Individuals who practice mindfulness reap a number of rewards beyond their physical and mental health. For example, interventions examining mindfulness in schools have found that students who practice mindfulness are less prone to behavioral problems and have higher rates of achievement. Furthermore, in studies of workplace success, researchers have linked mindfulness to higher rates of both job performance and job retention. Finally, studies examining the impact of mindfulness on relationships have found that mindfulness practice is strongly linked to closer interpersonal relationships, including enhanced romantic relationships. The practice of mindfulness is believed to impact our brain in multiple ways. On a structural level, mindfulness practice have been linked to increased activation in the left prefrontal cortex, a part of our brain connected to positive emotional states. Additionally, practicing mindfulness over time has been connected to decreased activation in the amygdala, an area of the brain implicated in our fight-or-flight and stress responses. Furthermore, regions of our brain linked to memory, learning, and emotion regulation are affected by mindfulness practices, as well. A recent study conducted on individuals who regularly engaged in mindfulness practice also found that mindfulness helps slow down a process known as “cortical thinning,” which refers to the process in which we slowly lose brain cells as we age. 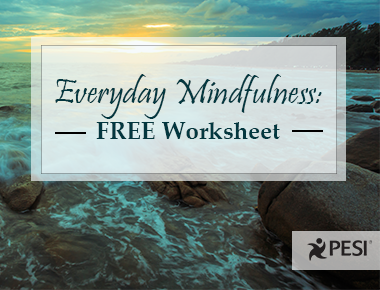 Want to help your clients discover the benefits of Mindfulness? 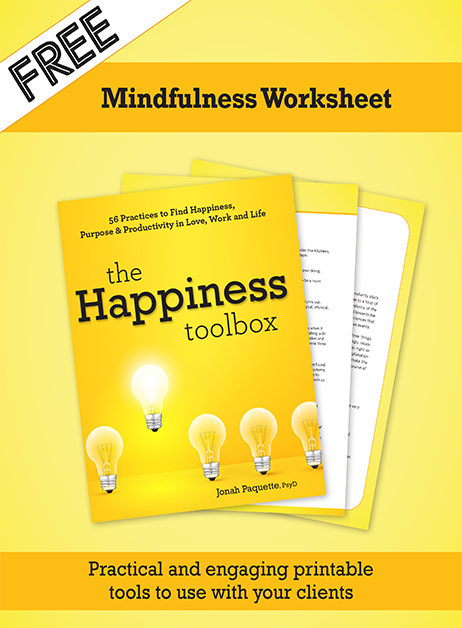 Download this FREE practical and engaging printable Three Good Things Worksheet, taken from the Happiness Toolbox, to use with your clients today!